The Storm Fighter hooded quilted flannel shirt is a great layering piece during brisk spring or fall days. This quilted flannel shirt will keep you warm during your project on it's own or as a layering piece. Includes a snap front closure, two chest pockets, and snap closure sleeve cuffs. The Storm Fighter High Visibility fleece sweatshirt with hood and zipper closure is ideal for work or home during the spring or fall season. Includes 4 inch 2 tone reflective tape for day and night time visibility. Meets CSA Z96-09 Class 2, Level 2 requirements and the Class 3 configuration when worn with the Storm Fighter high visibility bib pants. Includes 2 lower pockets, knit wrist and waist, front zipper closure, and fleece hood with pull strings. The Storm Fighter quilted flannel shirt is a great layering piece during brisk spring or fall days. This quilted flannel shirt will keep you warm during your project on it's own or as a layering piece. Includes a snap front closure, two chest pockets, and snap closure sleeve cuffs. 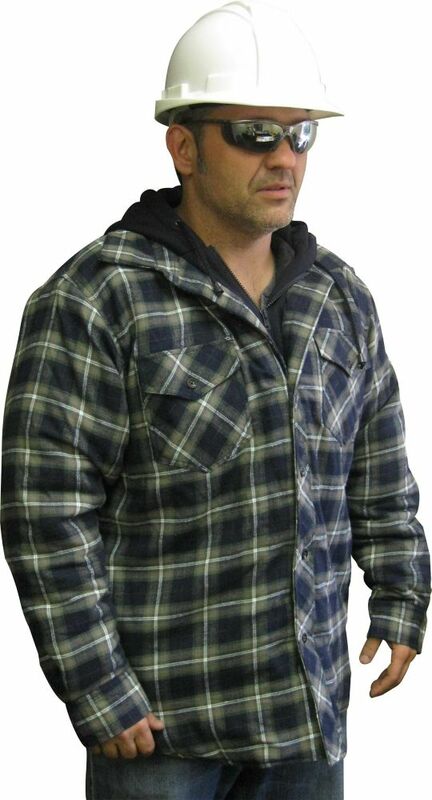 This Plaid Shirt features 100% polyester heavy weight solar fleece with button front closure. 2 chest pocket with button closures and adjustable cuffs. Available in Red, Blue or Grey. Hooded Quilted Plaid Shirt Double Extra Large The Storm Fighter hooded quilted flannel shirt is a great layering piece during brisk spring or fall days. This quilted flannel shirt will keep you warm during your project on it's own or as a layering piece. Includes a snap front closure, two chest pockets, and snap closure sleeve cuffs.